Francis of Assisi 24 June 1182 3 October 1226 Italian Pietro Bernardone dei Moriconi Pica de Bourlemont Friar, Philosopher, Preacher St. Francis of Assisi abandoned a life of luxury for a life devoted to Christianity after reportedly hearing the voice of God, who commanded him to rebuild the Christian church and live in poverty. He is the patron saint for ecologists. 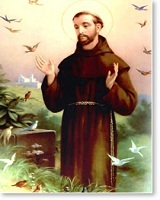 A list of popular Hindi Francis Of Assisi quotes are given below.